Actress Meghan Markle, who is marrying Prince Harry, stopped by TODAY back in July 2016 to show off her cooking skills. You may know Meghan Markle as the American woman who is engaged to Prince Harry — or the actress who plays Rachel Zane in the legal drama "Suits." But you should know that she's also a royally good cook. Back in July 2016, Markle stopped by TODAY to flex her cooking muscles and shared one of her favorite recipes: grilled Caesar salad with shrimp. 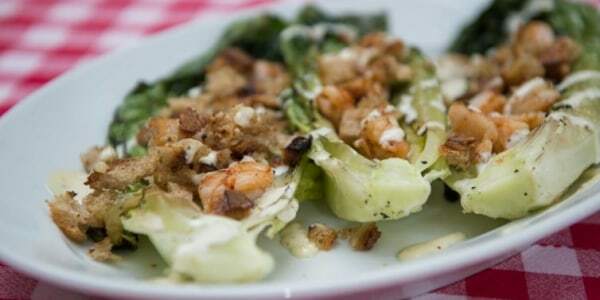 For this dish, Markle grills romaine lettuce and zesty marinated shrimp for an updated, slightly smokier take on the classic salad. "You can grill lettuce and it has the most amazing flavor," Markle said. Her big tip? Halve the lettuce lengthwise, but make sure to keep the romaine heart intact so it stays together when you cook it, getting those nice char marks, and then you can eat it like a "hand-held salad." Which naturally makes us wonder: If Markle served this up to the Queen, would she eat it with her hands? Of course, a simple salad (however delicious) isn't the only thing Markle can cook. In an interview with Good Housekeeping that ran earlier this year, the 36-year-old actress said that her go-to crowd-pleasing dish is roast chicken. And she just so happened to be making it with Harry when he proposed. Could it have been the world famous Engagement Chicken?! We'd love to know her special recipe for that dish.